Terrestrial Gamma-ray Flashes (TGFs) are intense sub-millisecond bursts of MeV gamma rays produced in active thunderstorm regions and temporally associated with lightning events. These events were discovered in 1994 by the Compton Gamma Ray Observatory, and they have been detected by RHESSI, AGILE, and both instruments on Fermi - the Gamma-ray Burst Monitor (GBM) and the Large Area Telescope (LAT). The rate of TGFs is estimated to be 500 per day worldwide (one for every thousand lightning events), but most go undetected, and this rate is uncertain. Recent estimates are higher. 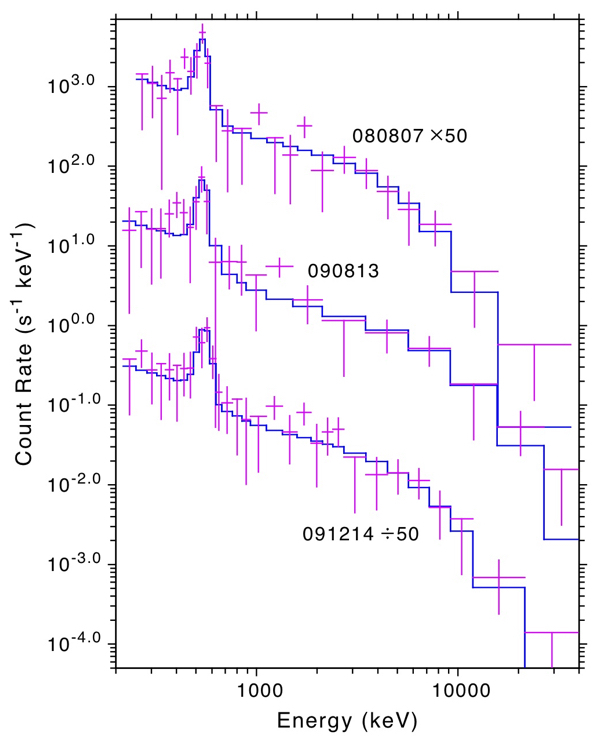 While TGF gamma rays have not been well-imaged, many TGFs are coincident with a lightning event near the sub-satellite point, suggesting that TGFs are associated with lightning processes. 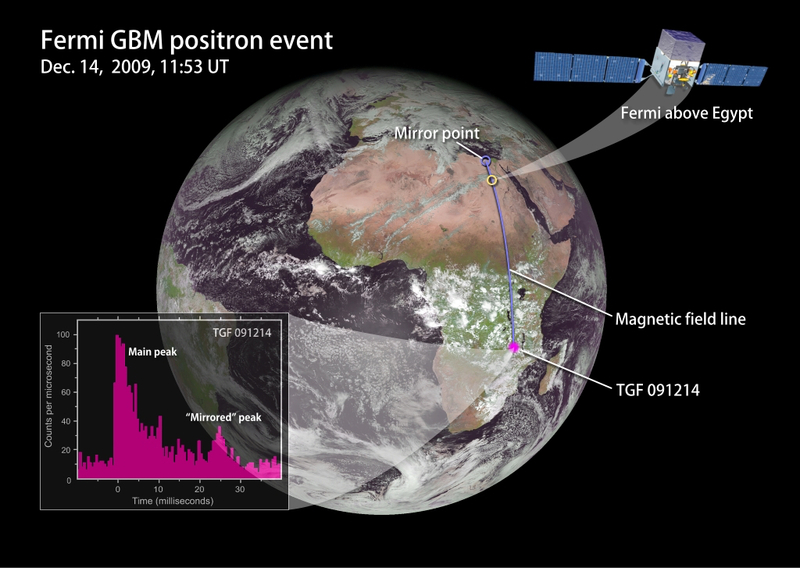 Detailed RF imaging of a few of these events suggests that the source of the gamma rays is ~10-15 km in altitude, well within the thundercloud and deep in the atmosphere. Thunderstorms are the most powerful natural particle accelerators on the earth, producing a shower of electrons moving near the speed of light. Recently the Fermi GBM has detected the signature of antimatter produced in these intense gamma ray flashes, a phenomenon never before seen. Intense electric fields (>100 kV/m) within thunderclouds can create an upward-moving, runaway avalanche of relativistic electrons. When those relativistic electrons are deflected by air molecules, they emit bremsstrahlung gamma rays. Many of those gamma rays Compton-scatter off electrons in air molecules and eject relativistic electrons. Other gamma rays pass close enough to the nuclei of atoms in air to pair-produce, transforming into a relativistic electron and positron pair. These high-energy electrons and positrons escape into space, confined to, and spiraling along Earth's magnetic field lines in a relatively narrow beam, where they can be intercepted by spacecraft traveling overhead. GBM spectra (magenta crosses) for three different TGFs showing the characteristic 511 keV line produced by positron annihilation (modeled in blue). Because charged particles travel along the earth's magnetic field lines, annihilation events can occur even when Fermi is not directly over the thunderstorm that produces a TGF. In December 2009, while flying over Egypt, the Fermi-GBM clearly detected a positron event from a TGF that occurred in southern Africa.